You must make bookings at least 5 minutes in advance of the time at Tao Tao Ju. In London’s Chinatown it takes a special kind of restaurant to stand out, but that’s exactly what Tao Tao Ju does. A relatively new addition to the Lisle Street scene, Tao Tao Ju is all about taking the Chinese dining experience to the next level, giving guests a touch of class and attentive service as well as great food straight from China. Elegantly decorated, the Tao Tao Ju dining room has plenty of traditional touches, including rows of red and gold paper lanterns in its windows and dark wood latticework panels but the understated colour scheme and simple contemporary furnishings are upmarket and chic. Food is all about flavour here, with great care taken to produce authentic versions of both favourite Chinese regional dishes and house specialties inspired by the home and restaurant cooking of the country’s diverse cities and villages. Great food. Handled a table of 10 very efficiently. Great rounds tables for big groups. Was a great night but restaurant was nothing special. Just nice . Food nice . Staff nice. Never a 5 * experience as advertised. Would go back but not what we expected. We were there to celebrate Chinese New Year. We arrived on time but had to wait for 11mins for our table despite arriving on time. The waiter who greeted us was friendly. However, when he came back to see us at the waiting area, he almost gave our table away to another couple. Dim sum was delicious, great selection & good value for money. The restaurant is clean & spacious. As we were about to finish our meal, a waitress was trying to rush us out. It was awkward and it’s a shame that we have to end our experience that way. We were not even offered a dessert menu. We had dessert somewhere else instead. What a shame to end our CNY celebration. Very nice atmosphere, food was great and seemed busy at lunch time. Friendly but rushed off feet staff. Wish they would smile more otherwise very business like . The street in which TTJ is located has many Chinese restaurants. I had done my research beforehand and I wasn’t disappointed by my choice. The atmosphere was very welcoming. The choice of set menus was excellent. The food was delicious. If I hadn’t been going to a show I would probably have tried a couple more dishes. I will definitely go again. Good place for several hungry friends to go. Fantastic authentic Chinese venue in the heart of Soho. Excellent, tasty food coupled with attentive service throughout the meal. Whole family thoroughly enjoyed the experience. Can’t wait to come back. Food is crazy good. You better have a reservation because the line was literally out the door. No real ambiance, service is all about flipping the tables, food comes out super quick and they speed you along. However, there’s a reason about 100 people walked in to eat in the hour we were there. Excellent what a find ! Will definitely go again . It’s our second visit and as always the food was great! 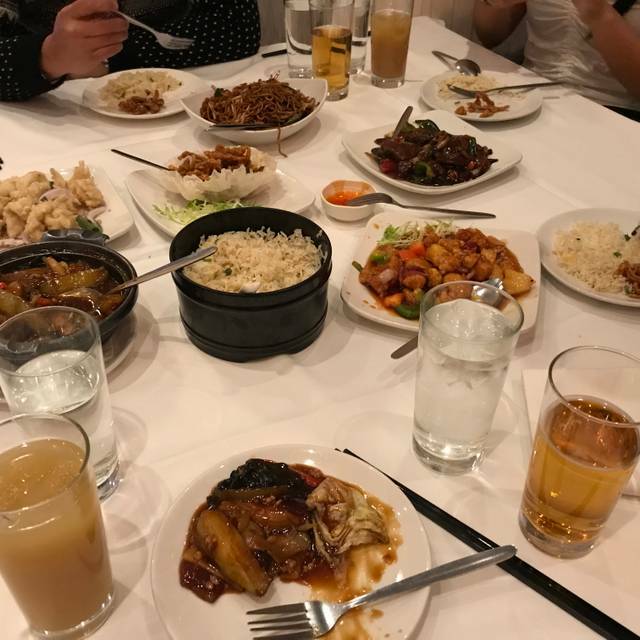 Celebrated out daughter’s birthday as she loves Chinese food. Always busy and pre-book a table if possible so you don’t get disappointed. Value for money and the servings are very good portions. We came late but notified the restaurant a beforehand and asked if that is okay, manager ensured that there is no problem with us showing up 10-15min late. Upon arrival, we were told that we must leave within 2 hours because there is another reservation. I understand that reservations are usually made for a couple of hours but it was quite rude to tell us that we have to eat quickly. We got starters first but unfortunately, we had limited time to finish it, because while I was holding a spring roll in my hand waiter came and collected the plates including the sauce and served us our mains. Sometime later we were given a bill, without us asking. Overall the experience was not pleasant and we were rushed to eat and leave. Wide ranging menu selections, mosty Chinese with several Thai items as well. Friendly staff, comfortable and cozy atmosphere. Pleasant lighting. Not to overly bright , like many Chinese resturants in London. Fun night for a group of 6 of us. Food is great but service is hard work as you have to put a lot of effort to be noticed by the staff. Overall I would recommend it as a good after works social place to eat. Loved it!!!! Great for family style meal. Excellent value for central London. Beer prices were a tiny bit high but again in central London and they gotta make their rent too. We were so full afterwards we couldn’t go for another pint. Absolutely no room in the belly. Very busy restaurant but service was efficient. Food was good quality and speedily delivered. Great value set menus along with extensive a la cartr and dim sum. Efficient and friendly service. Nice atmosphere. Drink prices very reasonable for London. Delicious food at a reasonable price. We over ordered (easy to do when there is so much to choose from) and the restaurant were happy to put the extras in a carry out tub for us. Really friendly staff and efficient service, although tables a little cramped. Food decent for most part but lettuce wraps filling was terrible on the border to disgusting. We complained and got a shoulder shrug from the waitress. Arriving at 18:15 we stressed the need to leave within an hour for the theatre. We were told this would be fine as the restaurant was not yet very busy. A first course was served quite promptly but then there was a long delay despite several assurances from the staff that the food was on the way. Eventually there was clearly not enough time to finish the meal so a waiter offered to box what remained as a take away. There was further stress when the restaurant had an internet problem and was unable to process my credit card payment so that the transaction had to be transferred to a neighbouring restaurant. This was a quick pre theatre bite to eat, but the crispy duck was dry and tasteless. 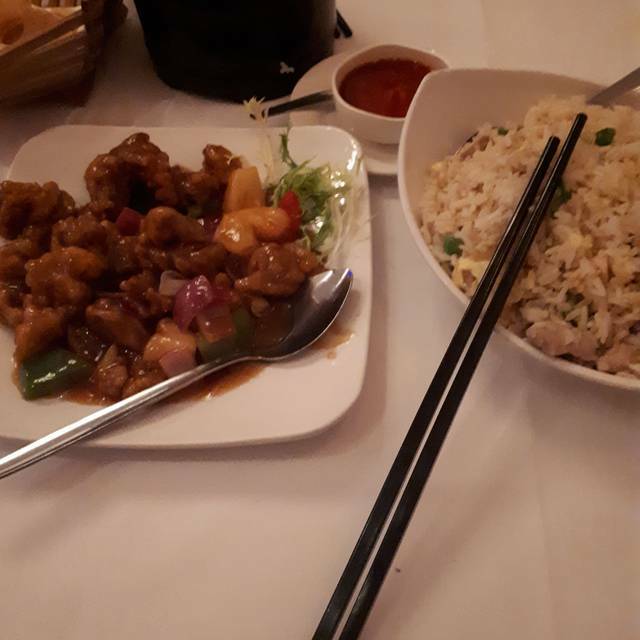 We went here because it had 4.1 stars but TBH, it was nothing special and akin to a chinese you'd find in a local neighbourhood with no discerning tastebuds- not in china town. Had a lovely lunch - staff very welcoming & food was great. Will be back! Completely average food, brusque service. A small noisy restaurant with zero charm. I’d look elsewhere. Fun evening, good relaxed service, good quality food. Generous portions and reasonably priced wines. First visit and would definitely go back and recommend. Good food, service isn’t great. Much less crowded and better value than the restaurants in the main Chinatown area. Friendly staff. Service fine, and we were pleased with all the food until the lemon chicken came - chemical and sherbety, not just nice lemon! Nice furnishings, didn't try the loos. Foods in general are great. Especially pan fired veggies were fresh and delicious and Dimsum wrap was thin which I like. On a busy Saturday night we were pleased to find a table for 8 (pre-booked) in Chinatown. We had a corner to ourselves where we could talk and enjoy ourselves comfortably. The staff were patient and helpful. The menu had many options for all our dietary quirks including vegetarian, gluten free, carnivores, sea-food allergies, small eaters and big eaters. The food tasted good, delivery was fast, portions were pretty generous. We were happy. Total cost, about £22 per head.